Getsu Fuuma Den is an action platformer game for the Nintendo Entertainment System. 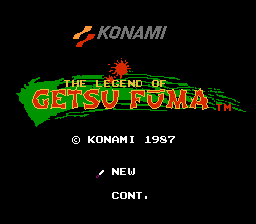 This is an English title screen hack for Getsu Fuuma. Just patch this to the RPGe English Translation.